Welcome to historic St. Luke's, the Old Garrison Church. St. Luke’s continues as a place of worship, as it has from the day it was finished in 1822. It is the second Anglican Church to be built in Annapolis Royal, replacing the first Church which stood on the corner of St. George St. and Church St. in the lower town. By 1810, the first Church had fallen into significant disrepair. The Wardens and Vestry determined to raise funds for the construction of a new Church, and to appeal to the Crown for a grant of land upon which to build it. A Royal grant of land provided for a Garrison Church for the military community serving at Fort Anne was received. 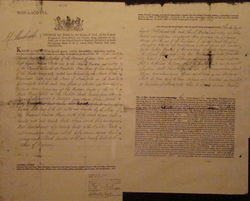 A copy of the Royal Grant is found in the Narthex of St. Luke’s Church. The grant was issued by King George III in 1814 to the Rt. Rev. Hon. Charles Inglis, Bishop of Nova Scotia, the Rev’d. Cyrus Perkins and the Church Wardens and Vestry, providing one acre, a piece of the 12 acres known locally as the White House field., for the specific purpose of erecting a Church. The grant stipulates that the needs of the military personnel stationed at Fort Anne, would be addressed by reserving for their use the balcony areas to be erected with the Church. As a Royal Foundation; having received a gift of land from King George III, the Church is entitled to show the royal coat of arms above its main doors. Over the years, the generosity of successive monarchs has resulted in other gifts received and cherished by our Church. Some of the worship materials, including a pewter chalice, an oil lamp, and an alms box, have been preserved in a display cabinet currently found in the Sacristy. Many pieces of furniture as well as the Queen Anne silver communion vessels were removed from the Parish by Governor Charles Lawrence in 1759, and presented for use in St. Paul’s Church, Halifax. A few items from the first Church of the Parish were removed and used in the new St. Luke’s at the time of its opening. In 1854, the last regiment left Fort Anne. Shortly after their departure, plans for the renovation of the St. Luke’s began. These renovations included the removal of the side balconies, the replacement of the boxed pews for the ones now in place, and the enlargement of the Chancel. The pipe organ [probably the second such instrument used by the Parish] was moved from the balcony to its current location at that time. From the end of the renovations of 1870, the interior of St. Luke’s was largely unchanged for almost 100 years. It would have commonly appeared as shown in this Easter photograph to the left, taken after 1910, when the pulpit shown in the lower left portion of the picture was received. Over the years, notably in the late 1920’s, and again in 2005, the Chancel floor was renovated, enlarging seating space for the Choir. In 2005, a second or “Transept Altar” was added to St. Luke’s, at the front of the expanded Chancel, providing a barrier-free worship space. In every Anglican Church, the sacred furniture includes: Font, Altar, Pulpit and Lectern. Their arrangement is so intentional that in Anglican Churches throughout the world, in both old and new worship spaces, their location is almost unvarying. The ordering and placement of pews varies greatly. St. Luke’s is the only Anglican Church in Nova Scotia and Prince Edward Island without a center aisle.